When I think about oatmeal, I think about the bowl of sweet, creamy goodness my Nana used to serve me and my sister when we visited her for the summer each year. Nana could transform a bland, boring a pot of oatmeal into something spectacular. Better than anyone on the planet. Sweetened condensed milk, cream, butter, brown sugar and cinnamon were the secret ingredients she used to metamorphosize bland gruel into that heavenly sweet goodness I loved so much as a kid. There was nothing like Nana’s oatmeal. It was a stick-to-your-ribs hug in a bowl. A bowl of Nana’s oatmeal sounds really good right about now, especially since I’m entering the third week of the Daniel Fast. It’s not that I’m being deprived, but I had to seriously modify my diet in order to be successful. As I mentioned in my last post, the Daniel Fast is a partial fast that allows fruits, vegetables, grains and so on. Sugar is not allowed, so the idea of having oatmeal during the fast was inconceivable. But I was in desperate need of something more substantial than a smoothie for breakfast. Since oatmeal is hearty and super filling it was my best option. When trying to come up with a recipe for a Daniel Fast acceptable recipe, my main goal was to make the oatmeal sweet enough to taste good without adding refined sugar. Inspiration came to me in the produce aisle when I noticed blueberries and strawberries were on sale. The berries would add the desired sweetness to the oatmeal without sabotaging my fast. Freshly squeezed orange juice and a touch of honey were last minute additions that made the oatmeal sweeter and a little creamier. But it wasn’t until I added some chopped almonds for crunch that I felt my oatmeal rehab was complete. Although it’s not my Nana’s oatmeal, I was pleasantly surprised by how good my fruity version tasted. 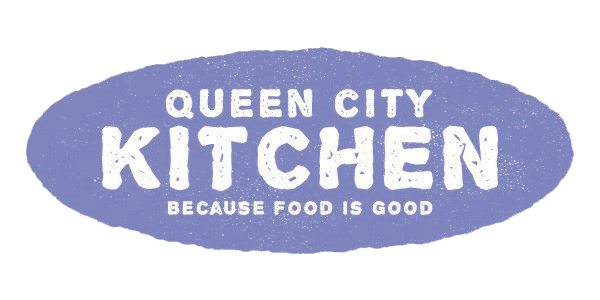 I’m definitely keeping this recipe in the rotation and saving my childhood favorite for when I’m feeling nostalgic for the love of my awesome grandmother. Bring the water and salt to a boil in a small saucepan over medium-high heat. Stir in the oats, reduce the heat to medium-low and simmer for 5 minutes, stirring occasionally. Remove the pot from the heat, cover and allow the oatmeal to sit for 5 minutes. Stir in the orange juice, cranberries, honey, if using, and cinnamon until combined. 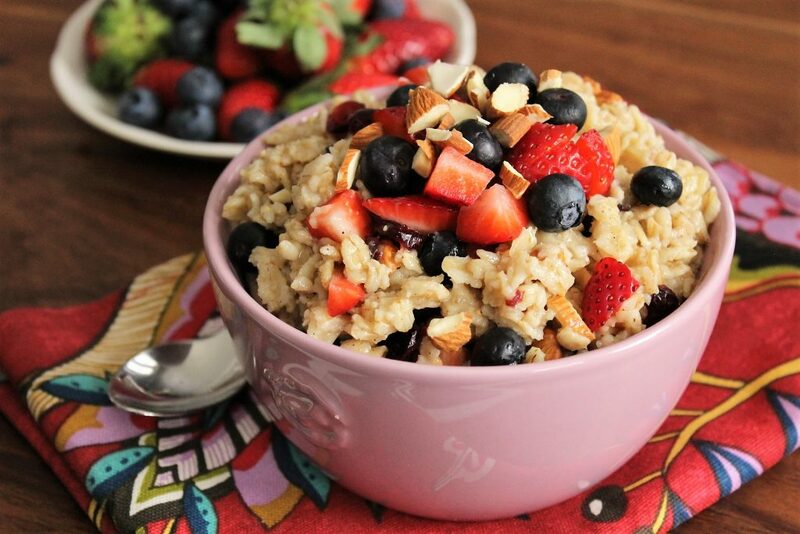 Spoon the oatmeal into a bowl and top with blueberries, strawberries and almonds. 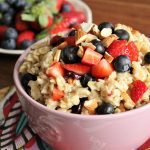 This entry was posted in Breakfast, Recipes, Vegetarian and tagged daniel fast, oatmeal, sugar-free on January 16, 2017 by Andria Gaskins.